The classic Vallée Blanche is the longest and best suited itinerary for intermediate skiers who are looking to enjoy the view above all, or for skiers whose technique is not good enough to envisage a harder itinerary. You will be skiing from the top of the Aiguille du Midi right down to Chamonix town, covering more than 20 km for 2800m of vertical drop. Along the way, you will be passing in this order: Le col du midi - Le Glacier du Géant - Le Refuge du Requin - Le Glacier du tacul - La Mer de Glace and finally a long forest path allows us to ski down to Chamonix. Half way down the Vallée Blanche, between the glaciers of the envers du Plan and Tacul we can stop at the Refuge du Requin, a charming and typical mountain hut where we can taste some of the traditional mountain dishes. Once our batteries are charged with cheese and ham, we will put skis on again to ski all the way down the famous Mer de Glace. Skiing down the amazing halfpipes sculpted by the flow of melting ice in the summer is always heaps of fun! We will then walk up a path 15 min (an obligatory section because of the glacier melting) to the Mottets hut where we can refresh ourselves with drinks before skiing the final section down an amusing forest path to Chamonix. The Vallée Blanche via the moyen envers itinerary is not majorly difficult, it does however have some technical sections and is therefore destined to people with good experience of off-piste skiing. 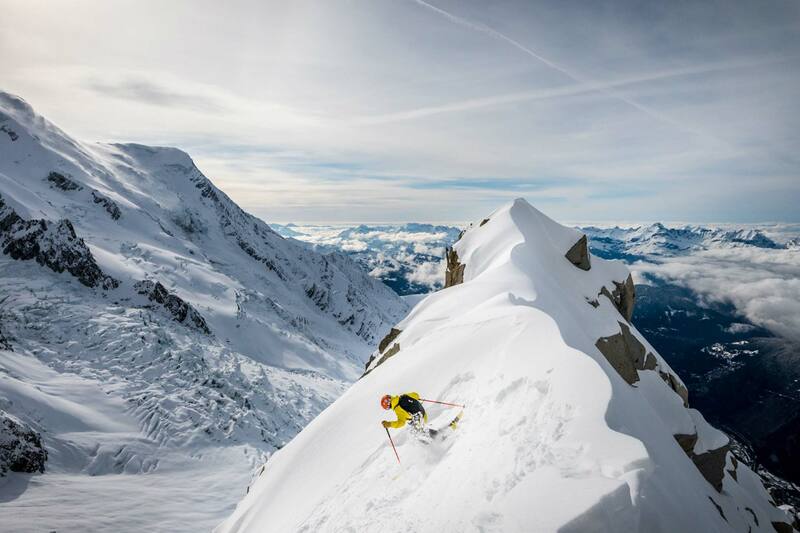 The adventurer in you will love all the little hazards of the moyen envers: Steeper sections, going around crevasses, narrow technical passages, powder snow and high altitude. You will be skiing from the top of the Aiguille du Midi right down to Chamonix town, covering more than 20 km for 2800m of vertical drop. Along the way, you will be passing in this order: The Glacier de la Vallée blanche - The Glacier de l’Envers du Plan - The N-E couloir of the S-E ridge of the Capucin du Requin, The Refuge du Requin - The Glacier du Tacul - The Mer de Glace and the final section through the forest down to Chamonix. Half way down the Moyen Envers, between the glaciers of the envers du Plan and Tacul, we can stop at a charming and typical hut, the Refuge du Requin, where we can have a break and taste some of the local mountain specialities. 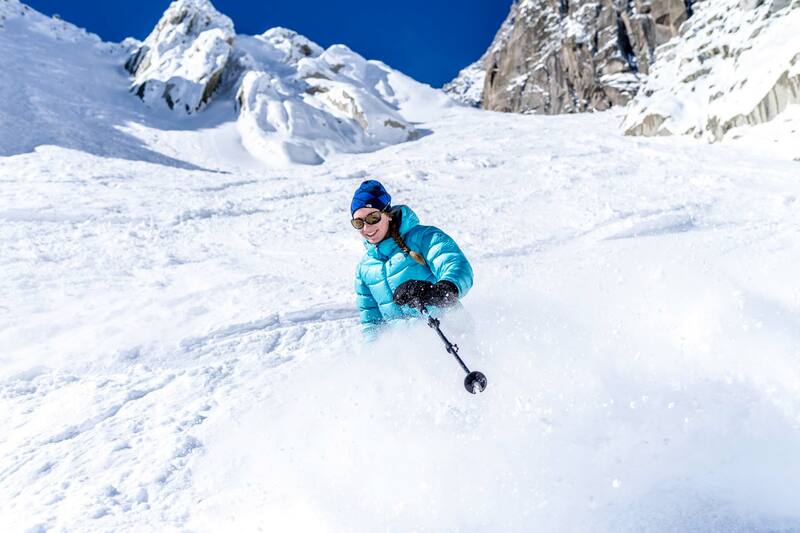 Once our batteries are charged up, skis on, we will continue our descent behind the Refuge where we can opt for several different beautiful couloirs that vary in steepness, before arriving onto the Mer de Glace and joining the normal Vallée Blanche. The last part of the Mer de Glace consists in skiing through amazing halfpipes sculpted by the flow of melting ice in the summer, heaps of fun! We will then walk up a path 15 min (an obligatory section because of the glacier melting) to the Mottets hut where we can refresh ourselves with drinks before skiing the final section down an amusing forest path to Chamonix.At the beginning and end of the season, the bottom part of the vallée blanche sometimes lacks snow, in that case, skiers have to take the famous “train du Montenvers” down to Chamonix which is an experience in itself! The Vallée Blanche via the Grand Envers itinerary is the hardest Vallée Blanche descent due to its steepness. 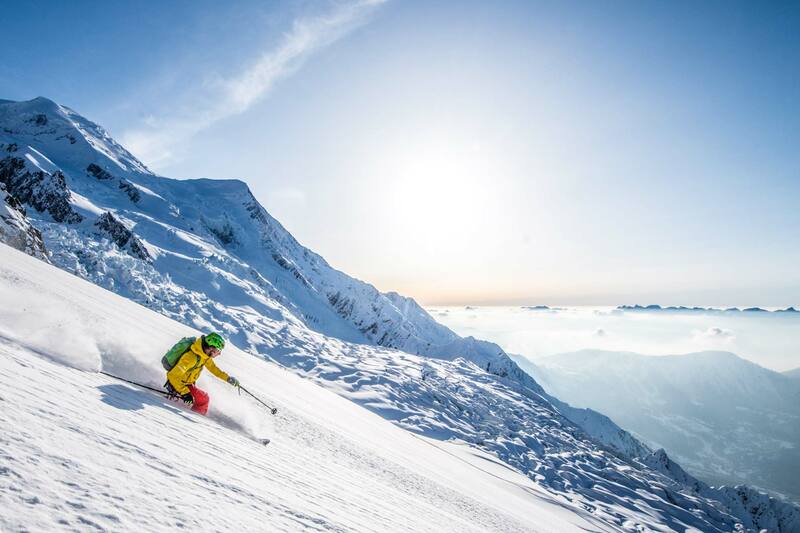 It is reserved for skiers who can manage their turns perfectly, who have a very good experience off piste skiing and who are used to skiing steep slopes (45°). The top section permanently requires skiers with commitment and good management of the effects of altitude. As expert skiers, you will love the combination of steep slopes, going round crevasses, narrow technical sections, powder snow and altitude! You will ski from the top of the Aiguille du midi right down to Chamonix, covering more than 20km for 2800m of vertical drop. Along the way, you will be passing in this order:-The thin ridge that separates the Midi from col du Plan - A first steep slope starting from the col du Plan - A second steep slope starting at the Rognon (3532m)- The Glacier de l’Envers du Plan- The Refuge du Requin- The N-E couloir of the S-E ridge of the Capucin du Requin - The Tacul glacier- the Mer de Glace and finally the long forest path that takes skiers down to Chamonix. Half way down the Grand Envers, between the glaciers of the envers du Plan and Tacul, we can stop at a charming and typical mountain hut, the Refuge du Requin, where we can have a break and taste some of the local mountain specialities. Once our batteries charged are up, skis on, we will continue our descent behind the Refuge where we can opt for several different beautiful couloirs that vary in steepness, before arriving onto the Mer de Glace and joining the normal Vallée Blanche. This itinerary is for skiers with good endurance and technique. 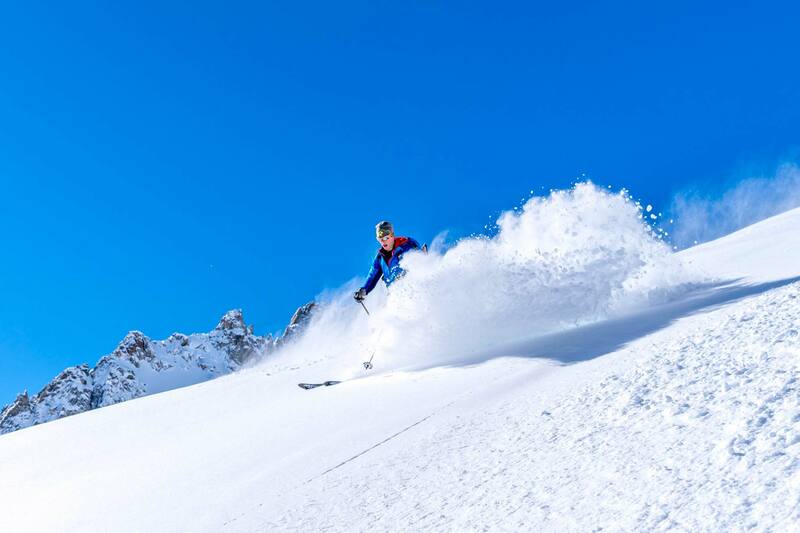 Combining these 2 itineraries is one of the best skiing outings in the Alps! Toule glacier is located on the South face of the Helbronner point, right on the Franco-Italian border. The Helbronner point is the normal starting point of the Vallée Blanche from the Italian side. For this incredible outing, we will meet at the entrance of the Mont-Blanc tunnel and take as many people as possible in each car. Once on the Italian side of the tunnel, we are only a few minutes away from the brand new SKYWAY 380° (the Italian equivalent of the aiguille du Midi cable-car) which will shoot us up to the top of the Pointe Helbronner (3462m) in just a few minutes. After a short descent, we will traverse 100 m to reach the col de Toule. From there, we will walk down an impressive 150m high metallic staircase to reach Toule Glacier. The descent on the South Face is great fun, never too extreme and with many different itineraries, allowing each and every skier to find fresh tracks in the powder! The descent finishes 1300m further down at the Pavillon (mid station). If the snow stays cold, we will be able to make the pleasure last longer by doing another loop!! After a nice Italian lunch ( at the altitude restaurant) we will prepare ourselves for the long 20km descent of the Vallée Blanche via the more pristine and less frequented itinerary of the Aiguille Noire. This itinerary will take us first down the right bank of the Glacier du Géant, then we will reach the Glacier du Tacul, and finally we will finish skiing all the way down the Mer de Glace. Towards the end of the glacier, we will ski through amazing halfpipes sculpted by the flow of melting ice in the summer, heaps of fun! We will then walk up a path 15 min (an obligatory section because of the glacier melting) to the Mottets hut where we can refresh ourselves with drinks before skiing the final section down an amusing forest path to Chamonix. At the beginning and end of the season, the bottom part of the Vallée Blanche sometimes lacks snow, in that case, skiers have to take the famous “train du Montenvers” down to Chamonix which is an experience in itself!